A vapor refers to a gas-phase material that that normally exists as a liquid or solid under a given set of conditions. As long as the temperature is below a certain point (the critical temperature; this varies for each substance), the vapor can be condensed into a liquid or solid with the application of pressure. The most common example of a vapor is water vapor (gas phase water) at room temperature and one atmosphere of pressure. Do not confuse a vapor with a dust, a fine suspension of solid particles or a mist, a fine suspension of liquid droplets. A good synonym (alternate word) for vapor is gas. When a substance turns changes from a solid or liquid into a gas, the process is called vaporization. The material is said to vaporize or evaporate. We can classify most materials as solids, liquids or gases. The primary distinction between these phases deals with the attractions/forces between the atoms or molecules that make up the material. Solids have strong intramolecular (between molecule) forces that hold the atoms or molecules together. Each molecule interacts closely with those around it and has very little freedom to change position. Solids that have an ordered array of atoms/molecules are called crystalline solids. Those that have no long-range order are called amorphous. Liquids have somewhat weaker interactions between the atoms or molecules. The molecules can move fairly freely past one another, and the material will tend to take the shape of its container. Liquids have no long-range order and very little short-range order. Gases have little or no interactions between the atoms or molecules. The distance between adjacent molecules is many times larger than in liquids and solids. Gases generally diffuse, spacing themselves throughout the container. 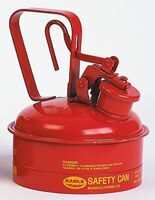 Store flammable solvents safely with safety cans and flammable storage cabinetsfrom Safety Emporium. It is quite common for materials to undergo phase transitions, i.e. a change between one state and another. For example, solids can melt to give liquids; the reverse process is freezing. Liquids can evaporate into gases; the reverse process is called condensation. Solids can sublime to give gases without ever forming a liquid; the reverse process is called deposition. This term is quite common on MSDS's and usually refers to hazards associated with the vapor phase of the material. Many vapors present both physical and chemical hazards. Substances that have high vapor pressures generate significant amounts of vapors. If these are asphxiants, flammable, and/or toxic, that can be bad news! Always use proper personal protective equipment (PPE) such as respirators and/or engineering controls such as fume hoods when working with hazardous vapors. If possible, avoid conditions which generate such vapors in the first place. Remember that vapors can travel a long distance from their point or origin, and that some heavier-than-air vapors may tend to collect in small areas. OSHA's Fatal Fact Sheet #3 discusses a gasoline storage tank explosion. OSHA's Fatal Fact Sheet #53 is similar. More on the State of Matter at Wikipedia. In 2011, a Pennsylvania judge ruled that pizza is a solid in a criminal misdemeanor case. See also: boiling point, dust, fume, mist.